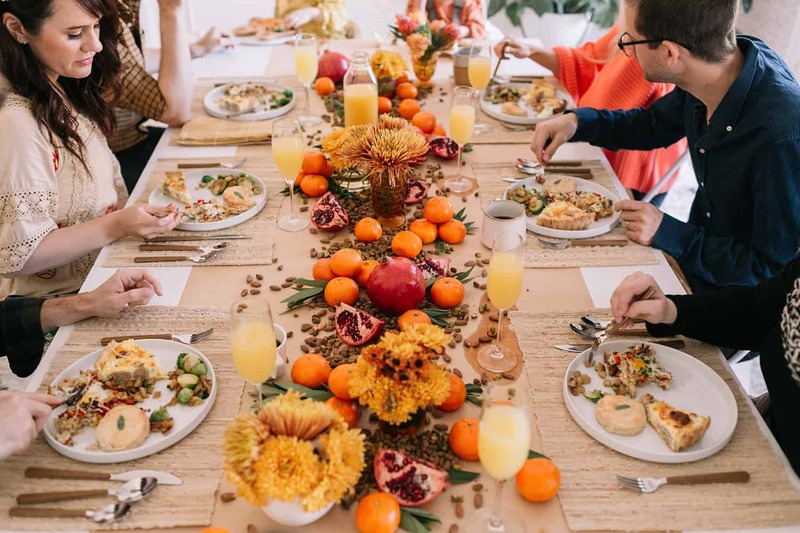 This year for Friendsgiving, we did a number of new things to keep one of our favorite traditions fresh. 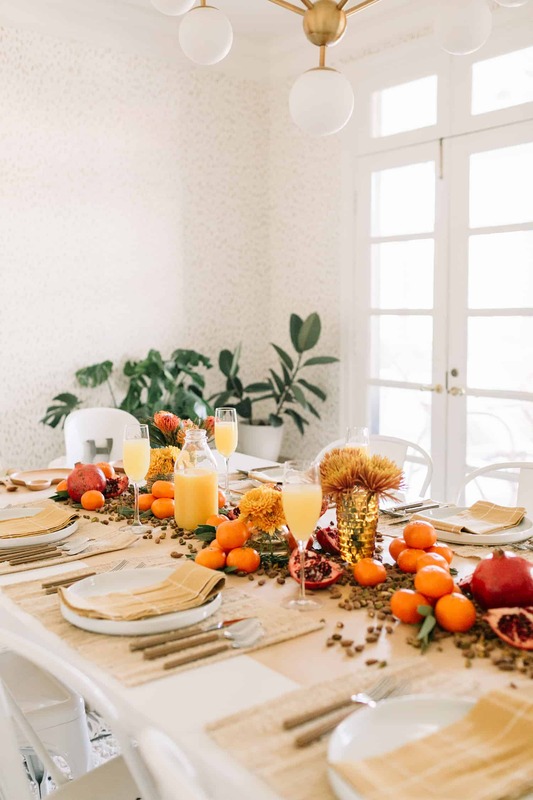 We kept the decor overall very simple with one very notable exception: We decided to create an edible centerpiece for the table, and I absolutely LOVED how it turned out! We partnered with Wonderful Halos for this post. 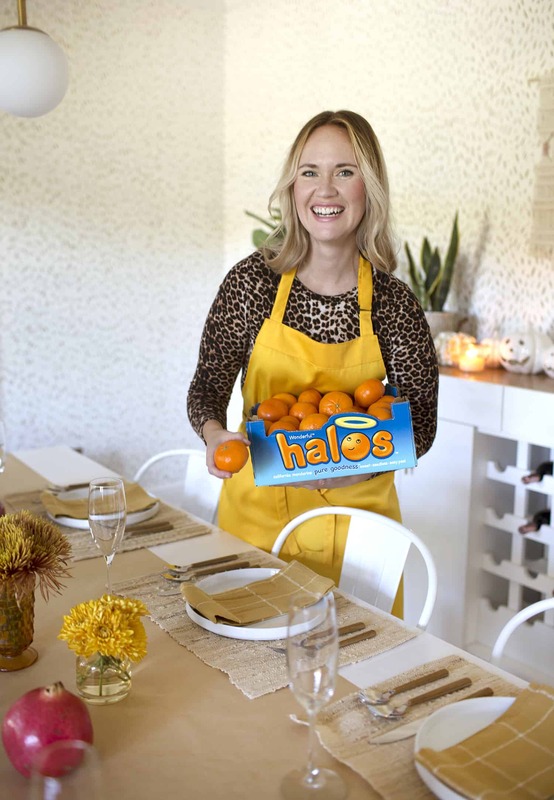 We used a number of delicious items in our centerpiece, but the Wonderful Halos were hands down the biggest hit. 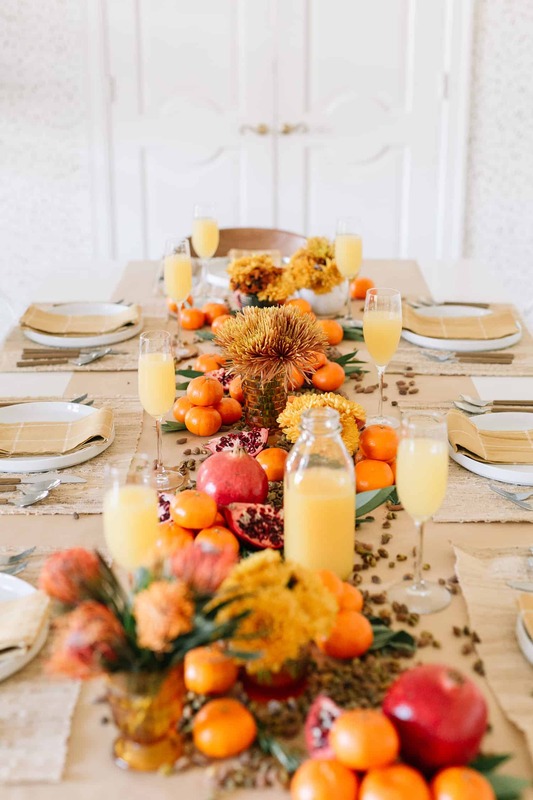 Not only is their color perfectly appropriate for the season, but it’s so easy to just pick one off the table, peel, and enjoy. 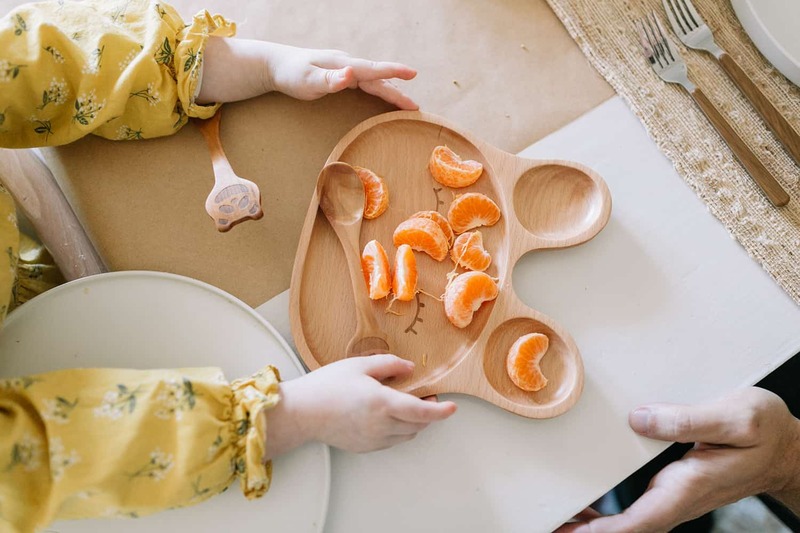 Not only did our kiddo guests enjoy the sweet, seedless mandarins this year, but quite a few adults (myself included) snacked on these while we waited for the food to be served. -The colors are absolutely gorgeous! -With cut fruit (or just cutting some fruit, not all necessarily) and fresh herbs it will smell amazing too. -No waste! 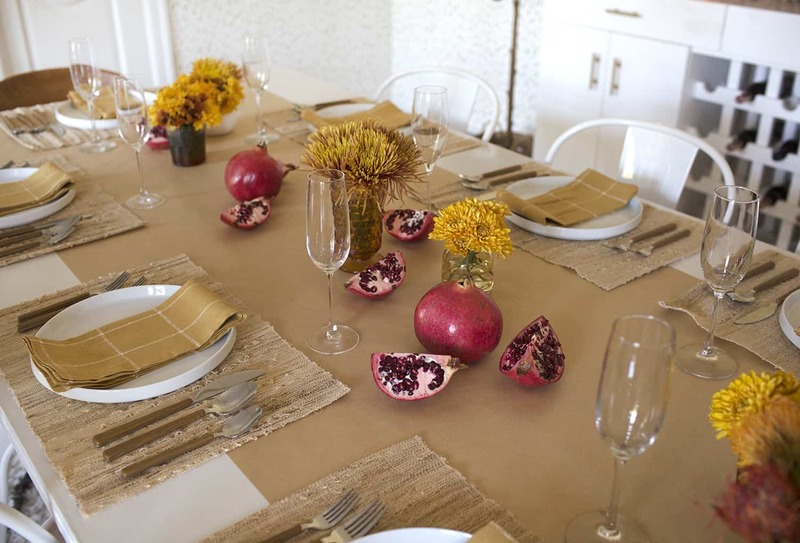 You don’t have to throw your centerpiece away or store for the next year. 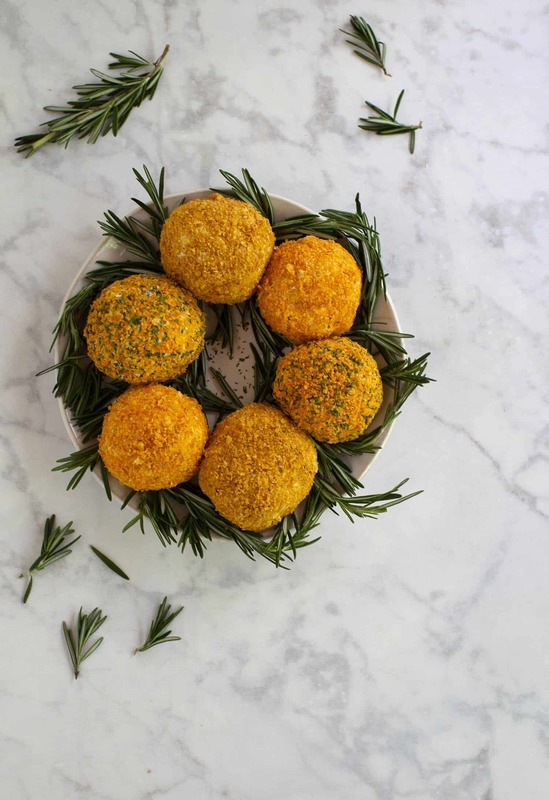 Whatever you don’t eat that day you can snack on for the next week or two, and even send some home with guests. 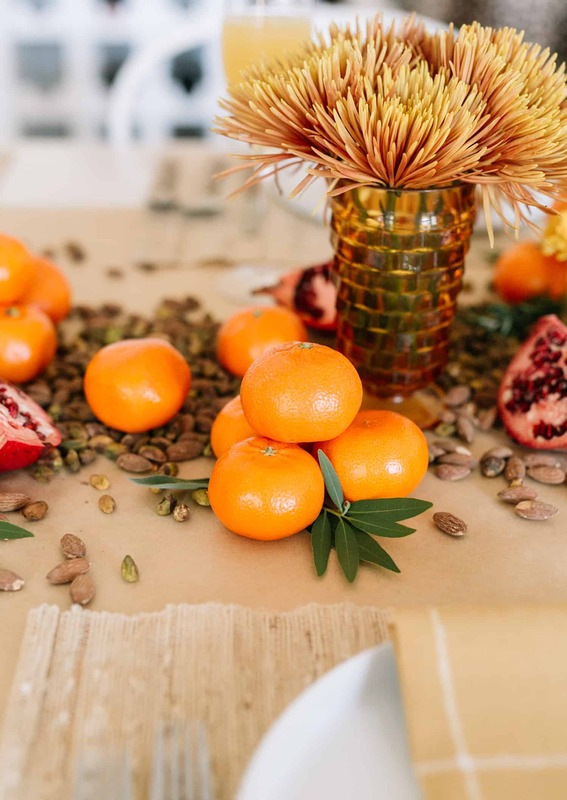 As you can see, we used Wonderful Halos mandarins, pomegranates, pistachios, almonds, and a few fresh herbs for our centerpiece. 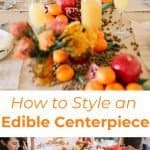 There are likely a number of ways to style an edible centerpiece, and I think it’s fun to get creative and do it your way. But, here’s what we did at our Friendsgiving this year. 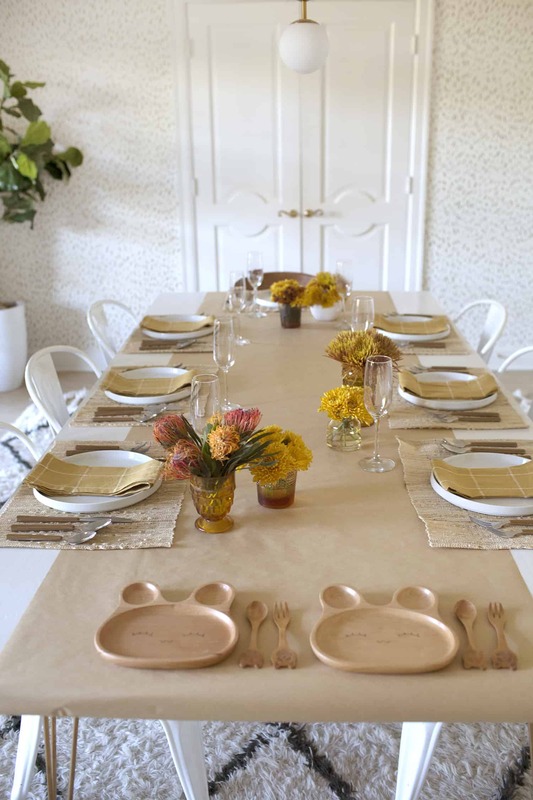 First, we covered the center of the table with craft paper. 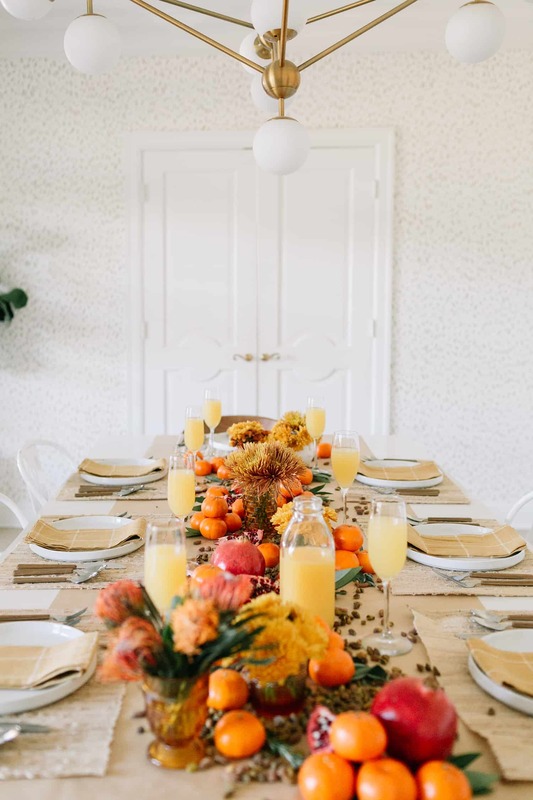 You could also use parchment paper, wax paper, or even leave your table bare (making sure to wipe it down well before styling) depending on the color of your table and how well it holds up to wear. 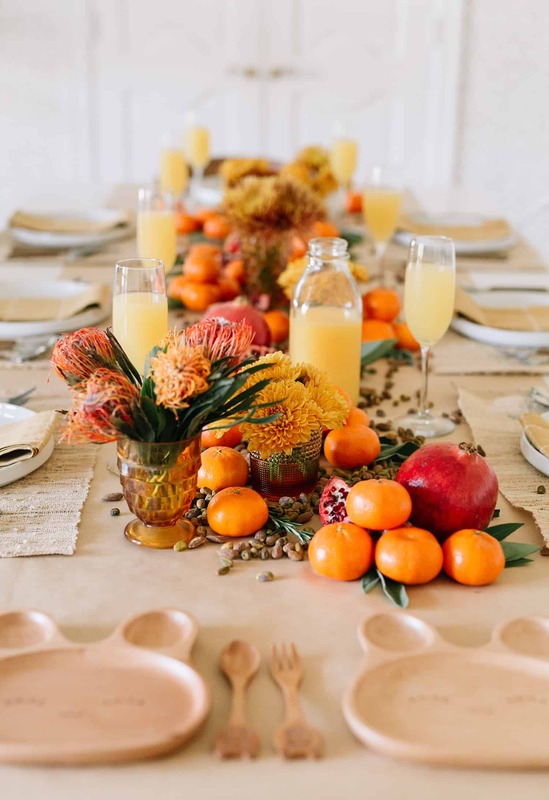 We styled our centerpiece starting with the largest items (pomegranates and mandarins) and filling it in with smaller items until we were happy with the overall look. I added a few fresh herbs at the very end to add a little color contrast. Credits // Author: Emma Chapman. Project Assistant: Laura Gummerman. Photography: Amber Ulmer and Emma Chapman. Photos edited with A Color Story Desktop. So cute!! I really love this idea. Also I have to ask…where are those adorable children’s plates from?! It is a tradition/custom among my friends here in France to pass around a huge bowl of mandarins or clementines at the end of a dinner party. It’s after the cheese course and the dessert, when people want to linger and chat but aren’t really hungry. It is nice to have something to do with one’s hands. I suppose in the old days, people smoked cigarettes but happily that is over. Peeling clementines is so easy, and they aren’t exactly heavy food, so you can always make room for a few segments. Very satisfying. Your idea to use them as decoration is downright brilliant. My only caution is that pomegranate can really stain. Beware if you’re using a nice tablecloth or wearing nice clothes. 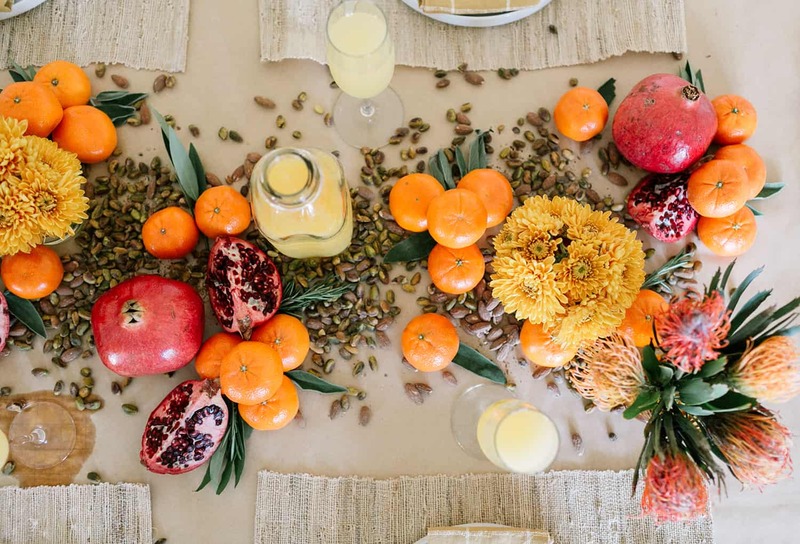 Oranges are going to adorn the table at the next dinner party! Wauw, I Love this! It’s absolutely beautiful!! What a brilliant idea to create a centerpiece that can be eaten! Thanks for sharing this! This is so simple and really quite comfortable, anyone should feel welcome and at ease. Nice there is nothing to put away after the end of meal! 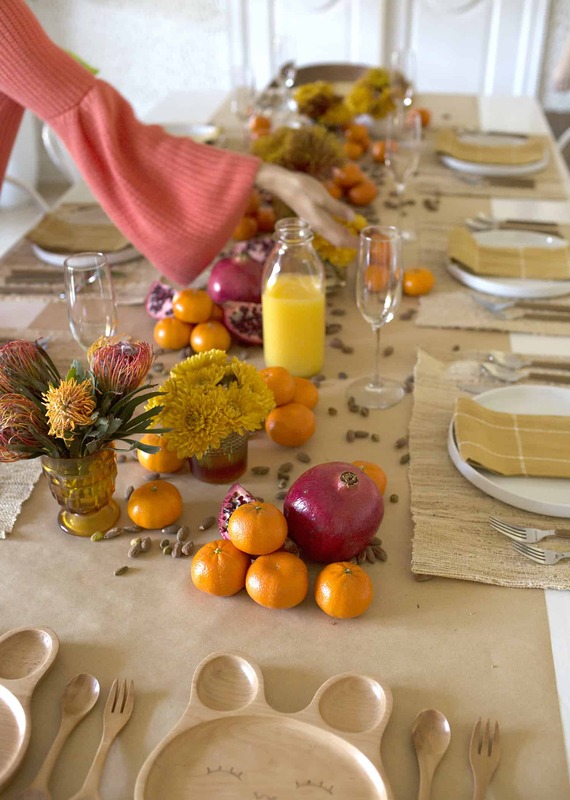 I love this idea, it looks stunning and no wasted food or decorations to store. I’ll use it for an upcoming celebration in a holiday rental as I don’t want to travel with my luggage full of table decorations! Beautiful centerpiece! Love the colors! I really loved the idea. The dessert is on the table!